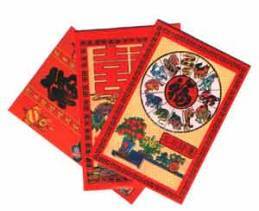 Home » Red envelopes – Ang Pow, laisee, lai see, red packets, hung bao or Hung-Bao – A perfect Chinese New Year school project. Red envelopes – Ang Pow, laisee, lai see, red packets, hung bao or Hung-Bao – A perfect Chinese New Year school project. Ang Pow red envelopes are also known as “Ang Pow” “red packets” “lai see” “laisee” “hung bao” or “hung-bao”. They are seen as extremely auspicious when given as a gift and are even more auspicious when they contain money. The main use of red envelopes is for Chinese New Year, birthdays, weddings or any other important event. 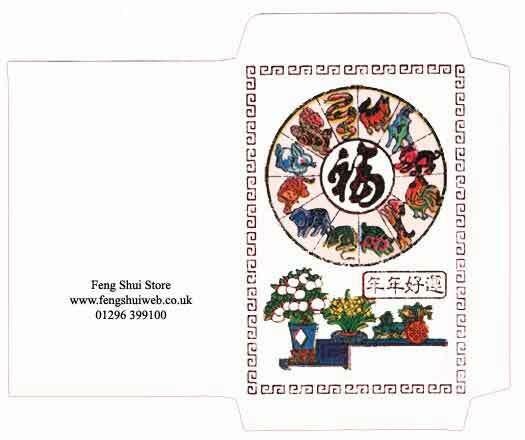 The image on the front of an Ang Pow represents blessings and good wishes of long life, success and good health to the receiver of the envelope. Artists have found new ways to improve the message of good tidings over the years such as carps swimming amongst flowering lotus, the fabled creatures of dragon and phoenix, chinese zodiac animals relevant for the year it will be used, peonies in full bloom, the three immortals, golden pineapples, Buddha’s and children. They all have very eye-catching designs and we have given and received some stunning Ang Pows over the years, from and to friends, clients and family. As a company, we handpick every design as the quality and presentation is very important. These are sent free with every order we send out to clients, the Ang Pows that we send contain Chinese i-ching coins for extra luck. Whenever you give money on a festive or auspicious occasion, you should never use a white envelope to put money in as a gift as you will face the bitterness of the receiver. Money that is received when it is a gloomy occasion such as a funeral when somebody receives a gift of money to help cover funeral costs; this is called “Pak Kum” which is when money for the family of the departed is donated. So if you ever come across a Chinese client think twice before giving them their fee in a white envelope as this could offend them although this is less likely in our western countries. The two tasks below make a great project for people of all ages, especially for children as it can teach them the cultures of surrounding countries. If you are a school teacher, please feel free to download and use in your classroom. You can download the printer friendly version by clicking this link. You can also save this to your computer hard drive if you wish to forward this onto your friends and family. My cousin Hannah Sacco printed this one below in black and white and then spent a few hours colouring it in, thank you for allowing me to show your stunning piece of work Hannah. Handmade from the template below and coloured by my 12 year old cousin Hannah. The story of Ang Pow red envelopes. The story of “ang pow” dates back to the Sung Dynasty in China. A village called Chang-Chieu was at the time terrorised by a huge demon. No one was capable of defeating it, not even their greatest warriors or statesmen. However, a young orphan, armed with a magical sword inherited from his ancestors, fought the evil demon and eventually killed it. The villagers were triumphant and the elders presented the brave young man with a red envelope (more like a red pouch I would imagine) filled with money for his courage in saving them. Since then, the ang pow has become a part of traditional Chinese customs. How much money do you place inside the red envelope? This all depends on the situation. 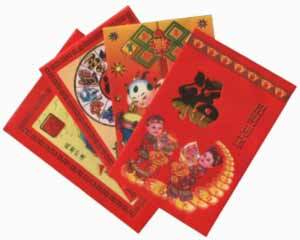 If you are giving red envelopes to children for the Chinese New Year, age will be an important factor. The usual procedure is that as you get older you usually tend to receive a bit more each year. For a 5 year old child, £2-6 GBP will be fine. The amount contained has to be in even numbers. Even numbers are considered auspicious and odd numbers are seen as denoting loneliness. Two pounds, eight pounds, ten pounds or twenty pounds are all auspicious amounts. I used to get extremely excited as a young child as I would earn myself a small fortune especially as mum and dad have so many oriental friends! 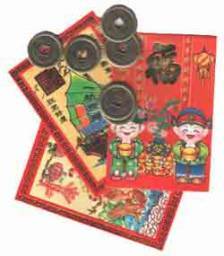 The number of coins or notes that are placed in the red envelope may take advantage of the Chinese homophones. For example: you can give a favourable amount ending with eight (8), this sounds like fortune in china; or nine (9) which sounds like longevity. Four (4) is not a good number to give as it sounds like death. You should always make sure that you give money in even numbers because unlucky numbers are considered inauspicious, although receiving a single i-ching coin in a red envelope is considered very lucky. We often supply red envelopes for weddings and if you attend a Chinese or even a western wedding and decide to make a gift of money, you should place it inside a red envelope. The amount that you give should be relevant to your financial situation and you should not put in more than you can afford as this can be considered as showing off. It is very similar with birthdays although the red packets will usually contain less money as birthdays are not considered as important as weddings. Giving red packets to employees before the New Year is also very common. This can be either a gift or a bonus. It is also believed that when you present them with your gift, their good fortunes will come back to your company. When are Ang Pows given? 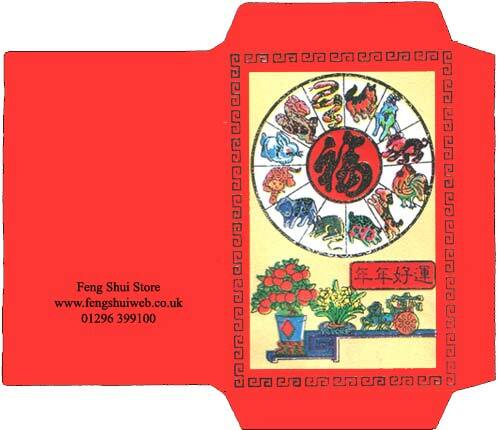 Although the tradition of giving and receiving red envelopes is centuries old, it is still as popular as ever! During Chinese New Year, they are given by married couples to small children, teenagers and unmarried adults. This year, Chinese New Year falls on the 14th February, which is also Valentines Day which will make the gift for unmarried adults extremely auspicious! Red envelopes can be given at any time and not just on a special occasion. Red envelopes are considered extremely auspicious. It is recommended that when you receive a red envelope you should use some of the money to try and pay some debts off if you have any. You should always leave a small even amount of money inside the red envelope and place it in your purse, handbag or wallet. A small selection below of our shop red envelopes, they really are a work of art and our quality is second to none; the quality is actually very important. It is traditional and customary to give a red envelope to parents when their baby celebrates their first month of life. The parents will, in return, distribute to well wishers gifts like red dyed eggs (and nui), yellow rice (nasi kunyit) with curry chicken or bean cakes (ang ku). Money is usually given as a birthday gift for people of all age groups. The elderly also give gifts of money to their younger generation when they celebrate events like their 70th birthday for example. Feng Shui enthusiasts believe that a red envelope containing a gold i-ching coin can bring good luck to the holder when it is placed in their purse, wallet, accounts books or handbag. Red envelopes can also be used as wish list holders; you write your dreams and aspirations on a piece of red paper and place it inside the envelope and sit back and wait. Some Feng Shui practitioners even insist on being paid with their cash fee inside a red envelope, this is not something that I adhere to though, although it is a lovely thought when I do receive it. We were contacted by a local primary school about eight years ago, the teachers wanted to give all their students an Ang Pow red envelope for chinese new year. we have many different schools that order large quantities of Ang Pows year after year which I think is lovely that they want to educate their student in other cultures. A sheet of white paper, red paper or paints/pens for black & white version. Pritt glue stick or paper glue. You should click here first to download the printer friendly version otherwise you will be printing all our banners and wasting your valuable ink cartridge. Print this onto a sheet of white or red paper, Cut out the red envelope and fold it along the dotted lines as shown below. 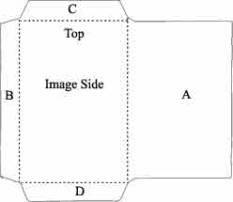 Straighten the packet out as shown below, and turn it over so you are looking at the side with the image, as in the diagram below. Now fold over flap A and apply some glue along its right edge. Fold over flap B and press it firmly onto the glued edge of flap A. Apply a little glue to flap D and press it firmly onto flap B & A. You now have your Chinese red envelope! Flap C is the top and this is where you should place the money in and then seal it after. Chinese New Year (according to the lunar calendar) starts on the 14th February 2010 and is celebrated by the Chinese all over the world. It denotes new beginnings and a fresh start. This is a time of celebration, reunion, forgiveness, sharing and thanksgiving. This is the date to celebrate the Chinese New Year with Ang Pow, fireworks etc and not the date you use to place your 2010 cures and enhancers in Feng Shui. The Lunar Chinese New Year Day is very different from the Solar (Hsia) New Year Day (February 4th 2010). The Lunar Calendar plans the days of the month according to the cycle of the moon whereas the solar year is governed by the sun. Although the Chinese solar year starts on a different date from the western year, the theory whereby the year is calculated on how long it takes the earth to go round the sun is the same. The lunar cycle lasts approximately 29.5 days and in order that the start of the Lunar New Year is not too far removed from the Solar New Year, the Chinese insert an extra month, this being called an intercalary month, once every few years. This is why Chinese New Year Day falls on a different date in each of the two calendars. Whilst the solar (Hsia) calendar starts the New Year at the beginning of Spring, which falls normally between the 4th and 5th of February, the lunar (yueh) calendar marks the New Year on the second New moon after the winter solstice. In 2010, Lunar Chinese New Year also called the ‘Spring Festival’, falls on 14th February 2010 which is the New Year that is celebrated by all ethnic Chinese. 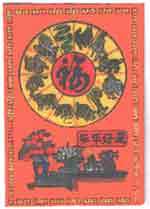 The solar New Year (4th February 2010) is not celebrated at all and only used for Feng Shui placement.